Spencer Brown at Sunseeker Poole tells me there's a £145,000 price cut on his central listing for sale, the 25m motor yacht Low Profile. 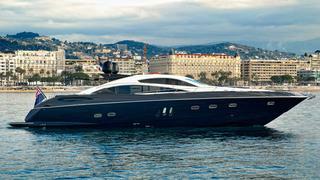 Built in 2008, she's a Sunseeker Predator 82, with a striking custom painted navy blue hull. An interior in black satin American walnut accommodates eight guests in a master suite, VIP stateroom and two twin cabins, all with en suite bathroom facilities. The cockpit, ideal for entertaining, has a Gaggenau barbecue and an electric canopy for shade plus a large dining table for al fresco cocktails and meals. A generous main saloon has two distinct seating areas and a Bose Lifestyle system with a 48 inch television and surround sound. Dining is for eight around a foldaway dining table. Low Profile has had only one owner since new and her twin 2,434hp MTU engines linked to Arneson surface drives give her a cruising speed of 30 knots and a thrilling top speed of 48 knots. Lying in Menorca, Spain, Low Profile is down from £1,395,000 to £1,250,000.